Maintaining uniform wall thickness throughout your plastic injection molding part design is critical. Without uniform wall thickness, many issues can occur such as sink, warping, short shot (meaning the material in tool does not fill correctly), and cosmetic imperfections. Selecting the proper material for your part design has a significant impact on wall thickness. How the part is expected to perform and under what conditions will play a considerable role in material selection. There are thousands of materials available to choose from. Material properties not only effect wall thickness but also effect strength and durability. 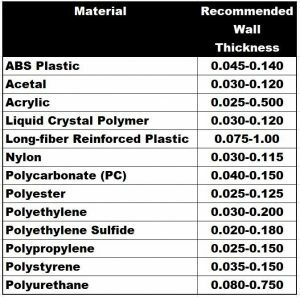 Below are some recommended wall thickness guidelines with some common materials. Refer to the materials page on our website for additional material options click materials . Do you have a question regarding your part design? Contact one of our Technical Specialists at 586-598-4636 or sales@xcentricmold.com. We will be happy to review your design and provide you with recommendations.